Usually the rally driver and drifter, and also motocrosser, use brake to get sliding effect as wheels are locked and lose traction. But what discussed in this article is to use the brake to prevent driving wheel spin freely due to slippage or loss of traction, as side effect of a component named differential. Brake is used to gain traction. Differential in four-wheeled motor vehicles, serves to adjust wheels speed when the vehicle is cornering. Because of differences in the radius of the circle, a wheel that is outside the cornering line will spin faster than the wheel in the inside. Suppose the vehicle turned right, then the left wheel will spin faster than the wheel on the right. Differential is only mounted on the axle that transmits engine torque to the wheels. In the rear-wheel drive system, differential is mounted on the rear axle. 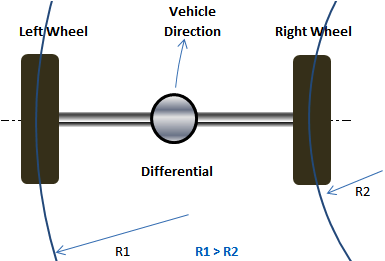 On front-wheel drive system, differential is mounted on middle of front wheels. For vehicle with 4 wheel drive system, differentials are mounted on the front and rear axles. Similarly to vehicle wheel with 6 wheel drive. On wheels that do not transmit engine power, these wheels are free to run and follow direction and speed of the vehicle, so no differential is needed. But, if one wheel that drives a vehicle slip or lose traction, then the differential will transmit engine torque to the slipping wheel. For example in a pick-up vehicle with rear-wheel drive, if rear left wheel slip in the mud, while the rear right wheel is on the asphalt. Thus, the left rear wheel will be given torque by the differential, but this wheel is slipping, so the pick-up can not move. This is not a problem if you use the differential that can give power to the wheel with best traction, for example using a Limited Slip Differential, or Locking Differential. For rear-wheel drive vehicles, such as pick-up and bus, hand brake or parking brake can be helpful to reduce rear wheels slip. The trick is to pull the hand brake half, so that both rear wheels have about same turning load, so the differential divides engine torque to left and right wheel. Step on throttle pedal a bit deeper to ensure engine provides enough power to overcome hand brake force and to drive the vehicle. Release the hand brake when the vehicle is moving normally. If the handbrake is pulled too much, then there is the possibility of engine shut off as not being able to overcome hand brake braking force and vehicle load. For front-wheel drive vehicles, such as sedan, if one of the front wheels lose traction, then it can be helped by pressing the brake pedal half. Do not press the brake pedal too much that make the engine not able to overcome braking force. This trick to reduce the loss of traction by using brake is very good for rear-wheel drive vehicle, because it simply by activating the parking brake half, and parking brake only works on rear wheels. While front wheels can turn freely and do not increase the engine load. On front-wheel drive vehicles, this method is somewhat more difficult to apply. Because the risk of using the foot brake will lock all wheels. But if both rear wheels are also slipping, then the risk of engine lack of power as wheel locking is lower. This driving technique can be applied when the driving wheel is slipping in the mud, sand, gravel, snow, grass,or wheel is lifted and drifted due to the uneven road. It would be better if this technique is done gently, because sudden movements can make tires lose grip. If wheel slippage is not because it is lifted such as tire sinking in the mud, the reduction in tire inflation pressure can help to increase traction, as wider tire contact surface will reduce tire surface pressure on to slippery ground or mud. Can be applied to manual transmission and automatic transmission (if the parking brake can be applied when the accelerator pedal is pressed on 1st or Drive position). You can prove this technique without the need to wait for your vehicle to slip. Procedure: jack the driving wheels, eg on the rear-wheel drive pick-up, jack the two rear wheels so that both wheels are no longer touching the ground or floating. Make sure both the front wheels properly blocked by wheel chocks to ensure the vehicle won’t move. Have someone to start the engine, then use the first gear to turn two floating rear wheels. Hold one of rear wheels with your hand, if the differential works well then you can easily stop a spinning rear wheel, and the differential will transfer torque to the wheel that are free and rotate it two times faster. Then, ask your friend to apply the parking brake a half while stepping on the accelerator pedal to increase engine torque to overcome braking force. Now try to hold one of those floating driving wheels, it will be very difficult to stop even impossible. Both wheels continue to rotate together even though you try to stop one of the driving wheels. Note: this procedure is only for standard differential, not for Limited Slip differential, ensure your safety before you perform this procedure. For front-wheel drive, you have to jack up both front wheels to float. Perform the same procedure as above, but apply a half foot brake in order to make both front wheels continue to rotate together although you hold one of those front wheels as you try to stop it. Traction Control System (TCS) or Anti-slip Regulation (ASR) are using the same principle, applying brake on slipping wheel to maintain traction and it is done automatically by computer. It is applied by Mercedes Benz, BMW, General Motors, etc.